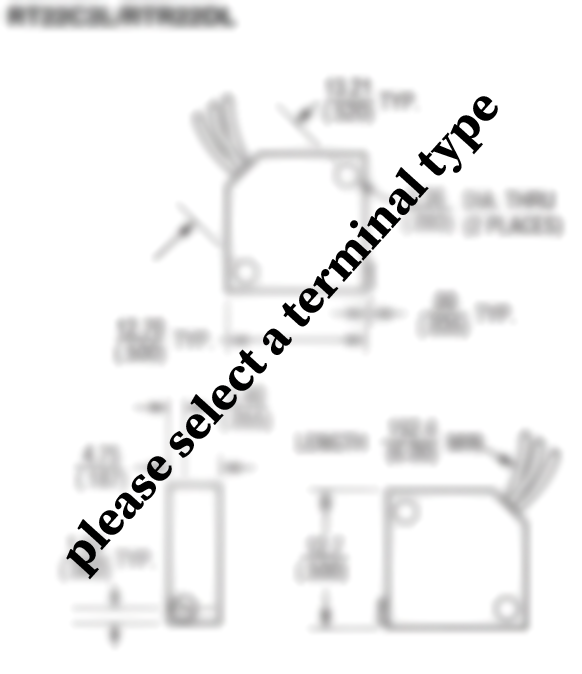 Trim Pots are basically miniature three terminal variable resistors (potentiometers). Trim pots have three terminals two of which are connected to a resistive strip or resistive track, the third is connected to an adjustable wiper. The position of the wiper on the resistive track determines the output voltage. The material that’s used for the resistive element typically is made out of a carbon composition(Wirewound) or cermet. Most common appilication for trim pots is fine tuning, (re)calibration, or any other type of adjustments in a circuit on a PCB(Printed Circuit Board). Due to their small size trim pots are very fragile, and most manufactures rate their lifespan at 200 cycles so frequent adjustments are not recommended. RT/RTR and RJ/RJR series trim pots are made to military specifications and are listed on the QPL (Qualified Parts List). Which simply means that they are on a government approved list of parts that are approved for government and military use. RT/RJ series trim pots are made to the MIL-PRF-22097 and the RTR/RJR series trim pots are made to the MIL-PRF-39035. The major difference between RT/RJ and the RTR/RJR series is that the RTR/RJR trim pots are offered with a failure rate. A failure rate is the frequency at which a component fails during testing over a set period of time. Note: Failure per 1000 hours of testing. 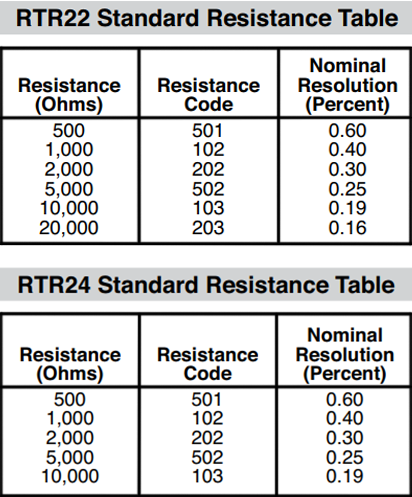 Although the RJ/RJR series and the RT/RTR series look pretty much identical, they have two different restive elements used for the resistive track that the wiper follows. All the series of trim pots mentioned above are a sealed style trim pot, which means that the resistive track and the wiper are covered by a protective material. Depending on the series, these trim pots they may either have a temperature rating of -55°C to 150°C or -65°C to +150°C. C2 = ±50ppm/°C Temp. Coeff. Max. 85°C-150°C Max. Operating Temp. F= ±100 ppm/°C Temp. Coeff. Max. Click here to browse our RT Series Trim Pot inventory. Click here to browse our RTR Series Trim Pot inventory. Click here to browse our RJ Series Trim Pot inventory. Click here to browse our RJR Series Trim Pot inventory.